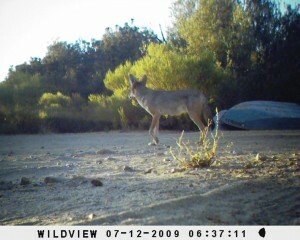 I have previously posted various photographs by an inexpensive “trail cam” made by Wildview (one “bubba cam” and one “Xtreme 2”). The Xtreme model replaced the earlier bubba cam. The price of $80 remains the same, but one can disable the flash on the newer model. These cameras operate on infrared heat sensing to activate a series of 3 photos taken 2 seconds apart. While they certainly do a job at a low cost, the sensitivity is somewhat low, there is no video capability and the extremely bright flash would tend to scare off subjects at night. 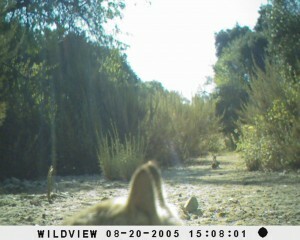 Placing the camera on ground level overcame the low sensitivity as the mass of an animal was much greater from the low angle. After several hours of internet searches and review reading, I purchased a Cuddeback N0Flash model for about $325. This one takes digital videos of between 10 and 60 seconds, color in the day and infrared lighting at night (hence, the “NoFlash” designation). It takes a single digital still upon tripping and then the video. 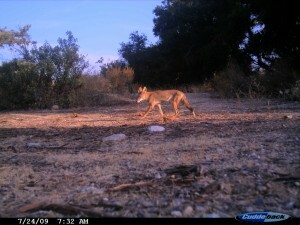 The infrared “flash” does not frighten wildlife and really aids in capturing action. The camera is much more sensitive as well and photos have significantly better resolution, though this is far from a high-grade digital SLR type camera. Lighting determines whether the recording has true color and/or too much contrast. Using a combination of several inexpensive “bubba cams” and one higher quality video-capable unit has worked nicely as a documentary tool for wildlife activity at BFS. 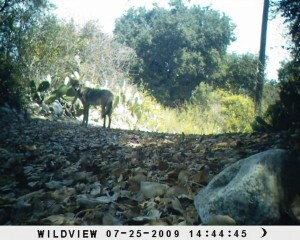 It comes as no surprise to people familiar with BFS that the place supports quite a few coyotes. What the cameras have revealed is just how prevalent they are throughout the field station and at all times of day and night. It is not all that common to see them during daylight hours, especially mid-day, yet the cameras have clearly recorded them moving about at the human lunch hour. The Cuddeback has made some fascinating videos (see the blog post linking vid captures uploaded onto YouTube) showing groups of coyotes moving and playing together at night on the eastern sections of BFS. 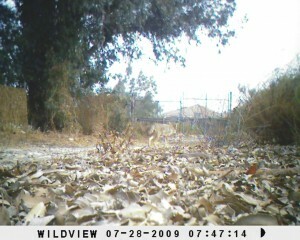 The cameras have also grabbed shots of a bobcat and her two cubs, rabbits, squirrels, thrashers and raccoons. Reports of fox sightings by students last year have yet to be confirmed with photographic evidence, however. 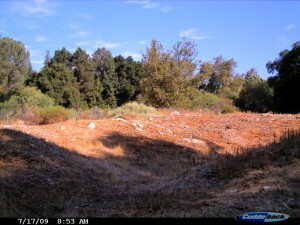 Don’t be surprised if you run across these cameras placed along trails or roadways and kindly leave them untouched. Oh, by the way, they also snap photos of people, a few of whom weren’t supposed to be here! 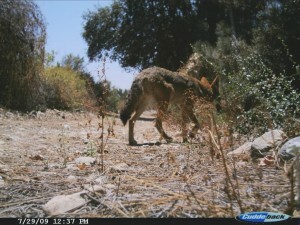 Coyote at Abilene Way (NW BFS) "Bubba Cam"
As can be seen, the Cuddeback does taken a sharper image. I will be posting additional photos in the near future.